It is a good idea to appoint one person to be responsible for looking after and setting up and pulling down the gear. The very first thing to do with screening a movie for a client is to be prepared. It is important to know the movie license is in place. A site inspection is a very good idea, particularly for larger or far away events with complications. Are there any ambient light problems which could wash the glorious movie picture right off the screen? This can easily happen with car parks and street lights. It is obviously essential to anticipate the size of the audience so as to know the size of the inflatable movie screen to take to site plus the amount of the audio requirements! Security of the equipment and of the patrons is important. It is a good idea to place a security fence around the intended front of the movie screen. This can be as simple as hi-vis traffic cones, lightweight crowd control barriers or special signage. To set up an inflatable movie screen the ground should first be cleared of sharp objects and then the tarpaulin laid down. The movie screen is then rolled out, unfolded and tethered correctly. Only then it is inflated. 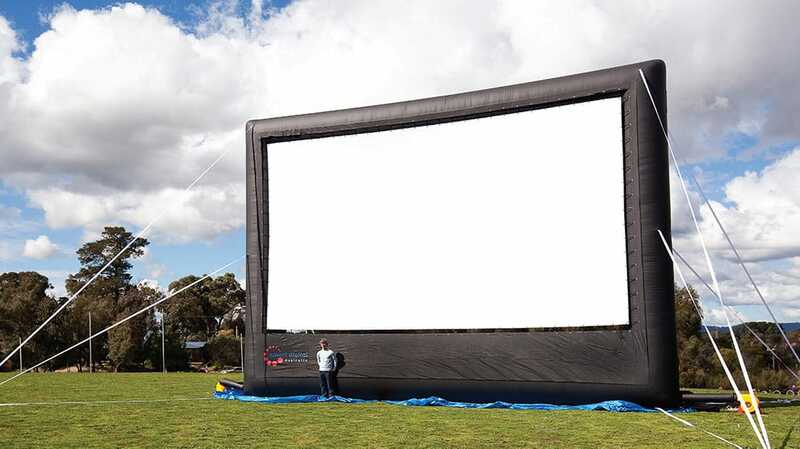 The outdoor inflatable movie screen should be the first item to install because that is what the event organizer wants to see, and that is what provides the wow factor for the event. A site visit or description is therefore highly important. It must be determined if the event is to be set up on the © 2016 Smart Digital Australia surface. If it is to be on grass, the question must be asked if stakes or pegs are allowed or should weights be used. If the event is on a hard surface there is of course no discussion! Shot weights are very popular for this task. Where water saving is not an issue, water containers will also do the job. The movie screen should have adequate skirt so that the people up the back can see clearly. The skirt is the distance from the ground to the bottom of the white image area. A 5 metre screen as an example will have a skirt of at least 1 metre whilst a 10 metre wide screen will have a skirt of about 2 metres. The inflatable movie screen must be tethered to the ground. This is for both safety and stability. If a big wind blast suddenly comes up and the screen is not tethered, it may suddenly take off! This could be very dangerous! Quality outdoor inflatable movie screens are generally certified to withstand winds of up to about 35 km/h. If the screen is correctly tethered, winds will not be a problem. However, in case of strong winds the attendance will be minimal. People only attend outdoor movie events because it is fun and relaxing. A gale force wind of 35 km/h plus does not fit into this definition! It is important to get the sound system working as soon as possible and start playing the agreed music out to the audience. This will ensure a great environment with lots of very happy people. The music will get everybody in the right frame of mind, make them relaxed and happy. Everyone will have a night to remember. The two most important things with a movie are image quality and sound. High quality stereo sound is paramount. 5.1 and 7.1 are a waste of time, because there are no walls in the great outdoors! Active or powered speakers work really well with outdoor movie. 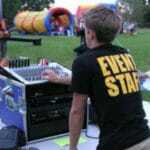 They are easy to set up and provide high quality clean sound. If you can see the movie image clearly and hear the movie soundtrack, you will have the most enjoyable evening. However without one of those, all will be lost. A decision must be made to use front or rear projection. This is easy with 3 to 5 metre wide screens featuring an easily removable nylon black back on the screen frame. Real estate may determine the availability of rear projection. Rear projection can be tidier and away from the audience, but does not work in all circumstances. When a professional rear projection screen surface is used, there will be a drop off of brightness of about 510%. When the theatrical quality Lycra screen material is used, the decrease of brightness will be minimal. A big question often asked is how bright the projector must be to place a great image on the movie screen. In short, a lot less than you anticipate! We have all worked with projectors in the office and at home where there is lots of light, if not ambient light. The big difference with outdoor movies is that there is no ambient light with the exception of street or car parking lights. For a 3-4 metre wide screen we find 2300 ANSI lumens to be adequate. For a 5 metre screen we normally use 3000 ANSI lumens. For a 6-8 metre screen we would normally recommend 4,000 to 5,000 ANSI lumens. For a 10 metre wide screen we would recommend a projector with about 6,000 ANSI lumens. Certainly you can use more lumens if you wish; you will not get any allergy for using too many lumens! The snag is that once you have reached a screen’s optimum level of brightness doubling the ANSI lumens will not double the visible brightness to the human eye. There are two major projector types around at the moment, LCD and DLP. Liquid Crystal Display is largely a Japanese invention whilst DLP comes to us from Texas Instruments. DLP has got considerably better over time and is now the preferred technical solution for movie projection. DLP is sharp, crystal clear and the blacks are considerably blacker than the alternative. A professional operator will carry a spare set of all major components. This is critical with cables, DVD players and projectors. It is too late to run back to base when the event is about to start! The availability of electrical power is a critical requirement. Luckily for DVD movies, normal single phase household power is sufficient. If a power outlet is not available within about 50-60 metres, a generator may be required. A generator with inverter provides the best quality power. For most movie systems a 5 KVA generator is suitable. The blower should be operated from a different power point to the rest of the equipment, if possible.